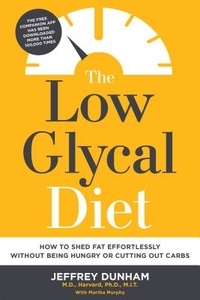 The Low Glycal Diet improves on the current, hot diet trends. Its innovation and effectiveness lie in controlling blood sugar level spikes with an easy- to-follow meal plan that will make you lose pounds effortlessly while you sleep. Just follow the color-coded meals with delicious recipes anyone can make, all laid out for your convenience in this one-stop weight-loss program. You will be shocked at how many pounds you lose quickly. How does it work? Harvard Medical School graduate Dr. Dunham developed this method by combining the best of the fat-resisting low-glycemic index that the South Beach Diet and the Low GI Diet use, adding in low carb concepts from the Paleo and Atkins diets, then controlling calorie intake over time to stop blood sugar spikes, the main drivers of weight gain. "Over time" is the secret; you can eat your carbs and have the food you crave as long as you eat them at the right time. This sets up your body to lose astonishing amounts of weight in your natural, overnight fast while you sleep. The meal plan is Dr. Dunham's amazing food formula to make this happen. You will see dramatic weight loss in the first week and real, long-term weight loss in the first month. Getting tired of the Paleo diet? Over and done with the South Beach or Low GI diets? Don't know where to turn next? The answer is right here; it's smart, easy-to-follow and proven effective. This is the best way to give yourself a healthy start today.